The soldiers of Feldmarschall Oberkommando are subject to a brutal training regimen. Here's a table of random wizards that I am saving for later, Hexamacht will become important if the PC's keep heading into the wilds, but this lot represent his enemies and competition South-West of Denethix. 1 Dr. Hendel (MU) – A researcher of unknowable age and a singular devotion to his study of fungus and slimes. Dr. Hendel appears as a normal enough older man in a scientist's white lab coat; however, Hendal has replaced his body's systems with colonies of various slimes, jellies, and fungus, over the eons making him effectively ageless and very very hard to kill. He is indifferent to more complex life and uses his control over his chosen research subjects to drive any humans or demi-humans out of lands he rules, replacing villages and fields with endless fungal gardens where he continues his experiments. 2 Blood-Mak the Unconquerable (F) – A stereo-typical fantasy warlord operating out of a rudely built log fortress covered in unnecessary spiky flourishes. He is a fierce fighter and inspiring leader, but has no magic powers. His army consists of a variety of heavily scarred, tattooed and pierced berserker types, each with a chain of terrified slave thralls the drive before them into battle. 3 The Rusted Man (MU) – Formerly Feretha's apprentice, he once had a name, but no longer remembers anything except years of pain and madness. Feretha's cruelty extended even to his closest followers and the rusted man has been permanently grafted to a laser armed Steel Leviathan. He has been installed into the belly of one of the machines, naked from the waist up and a mass of coiling conduits and tubes bellow. The Rusted Man controls the Leviathan as if it was his own body while inside it, but can exit it through a hatch and crawl up to 10' away before he reaches the end of his tether. Insane, hateful and alone he wanders the wastes and jungles, despondent and without purpose. He only occasionally remembers any spells, but his machine, despite it's age, is usually enough to protect him. 4 Fen Woman (MU) – A necromancer of considerable powers, the Fen Woman, or Vile Woman, resides deep in the fens surrounded by miles of zombie haunted muck. She can change her appearance magically, but will always smell of death and the swamp. Her minions are mostly undead, though she also employs swamp tribes, whose warriors poison their darts and whose hoodoo men know the secrets of magical drumming that vitalizes the normally slow undead with superhuman strength and speed. 5 Hittite, the Saurus Khan (TH) – Hittite was a nomadic triceratops herder until he slept on the wrong burial mound and the spirit of an ancient reptilian god took him over mind and body. Now he commands reptiles of all kinds, roaming the plains in a caravan of howdah backed dinosaurs and plundering anyone he finds. He has drawn a vicious cadre of plain's nomads to him in addition to his dinosaur herds, and with each passing week his human followers, and Hittite himself, become more reptilian in appearance and outlook. Hittite has only limited magical abilities, but is a deadly shot with his magical serpent bow. 6 The Ghost Parliament (MU) – A supernatural amalgamate made up ancient spirits that acts as a tribunal and executioner for perceived and imagined crimes based on a long forgotten and highly erratic legal system. Their metal fortress-tomb is long sunk beneath the earth, but they send their giest spies floating about the upper earth seeking 'criminals' to punish. When the objects of their attention are invariably convicted of some crime the Parliament dispatches its possessed assassins to pass what is always a death sentence. 7 Golden Masked Triumvirate (MU,F,F) - Three bandaged wrapped Wizards who operate from a stepped crystal pyramid deep in the jungle, they seek heart to delay the end of the universe, or possibly to hasten it – it's unclear. Each wizard wears a golden mask in the form of a jungle bird, two are further decorated with turquoise and denote the wizard wearing them as dangerous melee combatants. They are served by a cabal of feather humanoids and feather-clad jungle warriors. The Golden Masked Triumvirate often drugs their followers to increase their ferocity. The Triumvirate also has access to strange ray weapons with various powers. 8 Cutter Shanks (A) - It's said that Cutter Shanks was once a normal depraved murderer for hire, but that the desire for perfection drove him to greater and greater acts of assassination. So great was need to kill and so great his desire to perfect the art that he killed the God of Assassins. Somehow Cutter journeyed to the sky-temple of his god and slew it. Now he is a murderer without equal, but still he seeks to improve his technique by killing every day. His followers are a cult of assassins, some of whom appear robotic or cybernetic. 9 Bruised Immensity (F/MU) – Of incomprehensible purpose, the Black Immensity is a collector of souls, bodies and wills. A huge mass of limbs and flesh melded together and colored like a deep bruise, it was clearly human once, and somehow remains intelligent and willing to converse. Despite it's apparent rationality, every conversation with the Immensity ends with its victims stepping forward to give up their will and join the bruise colored mass. When it must act beyond it's palace of pools and terraces, or it requires more nimble servitors, the Immensity detaches parts of itself assembled into bruise colored men and women. These constructs vary both in appearance and degree of freedom: from carefully sculpted indolent concubines to brutish multi-armed warriors and almost formless cleaning thralls. 10 Feldmarschall Oberkommando (MU) – A Nazi mad scientist/occultist clad in a grey uniform and black crystalline face mask. He is not an accomplished sorcerer, having only perfected his art since fleeing the fall of Berlin through an mystic portal, but he has figured out how to uplift apes to almost human intelligence and render them fiercely loyal to his cause. Oberkommando is served by a few SS men gone to seed (armed with sub-machine guns) and a legion of uniformed chimpanzees wielding more conventional weapons. Great list there! Everyone one of them is really evocative. 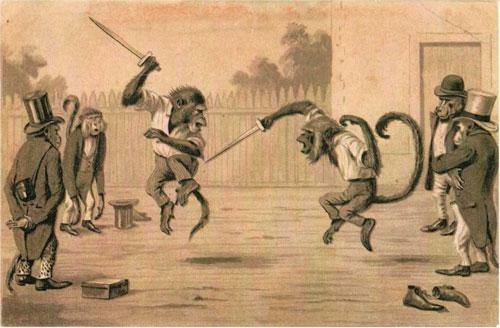 I'd been thinking about using that monkey-fighting pic, too but never got around to it. Trey, I enjoyed thinking of these wierdos myself - the bruised immensity is my favorite. As to the monkeys, it's an amazing illustration - I feel bad as using them as Nazi monkey's, but then again did you notice their "superior simian skull shape"?